One in 13! ONE in THIRTEEN! ONE in THIRTEEN! … Is that a lot? Actually, we know it’s an estimated 385 deaths, because the numbers are right there on the shareable graphic. (Good practice, that, well done!) But the first thing that occurred to me, as I looked at the graphic, was that the “one in 13” ratio is only alarming to me because I knew, even before I saw the raw numbers, that Americans shoot a lot of each other. 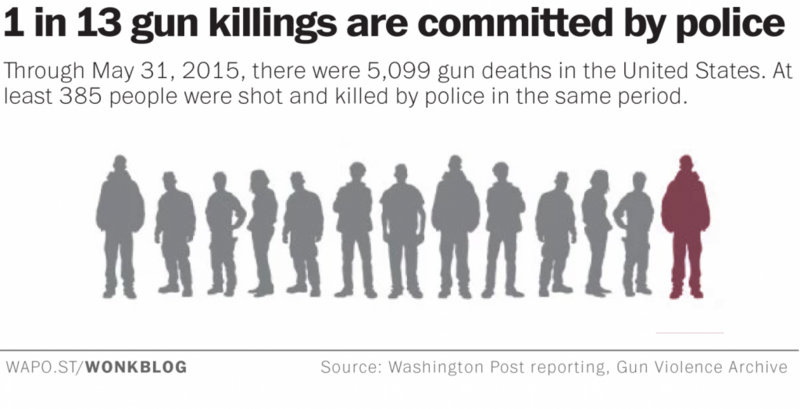 According to the Post’s data, there were 5,099 shooting deaths in the first five months of 2015! If we had the per-capita shooting death rate of a civilized nation, the police could shoot exactly as many people and end up with a much higher ratio, but would that be proportionally more alarming? And then the second thing that occurred to me was that, actually, I can picture a scenario in which I’d prefer for the ratio to be higher — if I could trust the police to shoot people only when necessary, unencumbered by systematic biases and a proclivity to use maximal force. Heck, in a world where fully trustworthy police were responsible for 100% of gun deaths, that’d mean no gun deaths resulting from four-year-olds rummaging in their parents’ nightstands, and no gun deaths by paranoid old white dudes who hate rap music. I’d actually quite like to live in that world. Really, all of the underlying understanding that makes the info-graphic stat alarming and newsworthy and share-able is more depressing and infuriating than the statistic itself: we live in a country where guns are used to kill far too many people, and we don’t trust the police to treat their fellow citizens fairly. Happy day-after-Independence-Day! This entry was posted in curmudgeonry, politics, science and tagged guns by jby. Bookmark the permalink.